The Speedglas 100 Series Raging Skull Welding Helmet has high-end features, low-end price from a world leader in welding safety. The highly-affordable Speedglas 100 welding shield has excellent optical quality, reliable light to dark switching and can be used with most arc welding such as stick (MMA), MIG/MAG and many TIG applications. The easy-to-use Speedglas 100 is the ideal “first” auto-darkening shield for hobby welders, farmers, DIY types, and maintenance or construction workers who weld infrequently but can benefit from the ability to always clearly see with their welding protection in place. 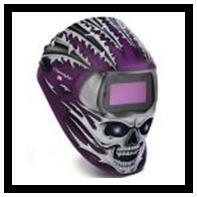 3M is also offering the Speedglas 100 welding shield in five unique versions - all you have to decide is whether you want to be wearing The Blaze, The Mechanical Skull, The Tribal or The Trojan Warrior – or you may want to be seen in The Chrome.